This article was originally published 11/4/2013 at Latino Rebels. Congressman Luis Gutierrez at event sponsored by the Alliance for Citizenship. Photo by Kent Hoover. Why are trusted advocates reinforcing the President’s narrative that he is helpless in making humanitarian interventions in a system that sits squarely under the executive branch? The people’s history will show record that while grassroots leadership called for a stop to continued apprehensions, detention and deportations, non-profits in favor of “comprehensive immigration reform” under the banner of Reform Immigration for America, Alliance for Citizenship, America’s Voice and others demanded the government open up to have a vote on the bill currently in the House. As an undocumented immigrant I am familiar with the solutions discussed within our community and I want you to know there is a difference between the human rights we want and the inhumane reforms people ask for in our name. The strategies coming from our organic leadership are about defending and gaining human rights, often locally, and promoting truth and political education that address real root issues. It is this leadership that works to stop deportations and pushes policies like the Trust Act in California and local bills that allow for people without papers to drive with licenses. It’s disheartening. CIR is built on dishonest messaging, and a strong pledge to the Democratic Party — not our community. Furthermore, if these organizations and politicians claim to be “Pro” migrant why aren’t they giving our community the facts and engaging them in building truly pro-migrant legislation? It’s vital to dispel these lies once and for all. No need to make it personal, no need for name-calling, it’s just time for the truth. Infographic by Hatty Lee, Colorlines. Lie #1: “We can pass just and humane immigration reform.” Key words: just and humane. It’s important to know that historically when immigration bills enter the senate, then the house, they don’t get better, they gain bad amendments like a hippie volkswagen bus gets stickers. The context is that the bills we’ve seen enter the legislative arena, already come heavily compromised. You can see the result with the SAFE Act (Strengthened and Fortified Enforcement Act) which would make post Immigration Reform undocumented presence in the U.S. a crime punishable with jail time and long term detention imprisonment. Also, amendments on border militarization would devastate border communities, as Christian Ramirez, director of San Diego’s Southern Border Communities Coalition told The New York Times, “This amendment makes border communities a sacrificial lamb, in exchange for the road to citizenship.” There’s nothing humane or just about this. Lie #2: “The Comprehensive Immigration Reform bill is a good step forward.” The undocumented community especially needs to know that is a complete bold face lie being repeated over and over by people who are ok with supporting a bill that will benefit a minority and gravely endanger a majority. Future generations of undocumented immigrants will face dire consequences and our already limited capacity and resources for organizing will be further burdened – pushing us into more defensive tactics when we really want to build a human rights movement and innovate with legislation that will protect our rights and our lives. Critics call these assessments divisive, but we call it being honest with our community. Lie #3. “Reform will put 11 million on a path to citizenship.” For starters, people are still being deported every day as Homeland Security works to fill a 400K a year deportation quota. And it’s estimated that 4-5 million will not make the cut for RPI (registered provisionary status). Given that one can’t be unemployed for more than 60 consecutive days and that it’s a requirement to remain 25% above the poverty line in order to arrive at citizenship – it’s easy to understand how undocumented people of color will be impacted, and especially undocumented black people who due to racial inequities have the lowest employment rates. The path is more like an obstacle course. The truth about big bucks in migrant suffering. The Obama administration has separated more families and nearing 2 million. In fact, he’s deported more people than the last three administrations combined. Obama has failed to address immigration in any real way, by making S-Com (the deceitfully named Secure Communities deportation pipeline) a mandatory program, and giving a green light to Operation Streamline all which fatten the pockets of Corporate Corrections of America and Geo Group by more than $1 billion a year in federal funds which translates to immigrant suffering and incarceration. It’s well documented and worth pointing out again as Laura Carlsen, Director of the Mexico City-based Americas Program of the Center for International Policy, wrote in March, “Among the gang of eight senators, all but Lindsay Graham and John McCain have received significant money from the private prison corporations.” That includes senators that CIR-supporting nonprofits often praise like Chuck Schumer (D-N.Y.), Marco Rubio (R-Fla.) and Bob Menendez (D-N.J). Being honest about real solutions. How can this bill be comprehensive in any positive sense, if it does absolutely nothing to address the root causes of undocumented migration? Migrants need to be engaged by sending countries and the US to craft real solutions. Real solutions would prioritize families rather than rich kids, and they would look toward getting rid of the free trade agreements that have set off a chain of events to cause many farmers and working class people to lose their professions and seek work here in the United States. Real solutions would address environmental pollution and destruction in the global south and continued subsequent displacement of millions that is sure to come. 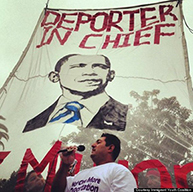 Dear President Obama: Stop deportations and give deferred action to all! We hear the President’s nice words about immigration, but we live out the difference between his words and action. If he’d listen to our voices, he’d stop deportations, free the prisoners that are currently being exploited in private detention centers, and reunite the families he separated and people he deported, granting deferred action for parents and older adults. He has the executive power to do so, but aided by mainstream reform advocates, he is remaining loyal to corporate interests and has along with many nonprofits become complimentary to Right Wing extremism. Undocumented & Unafraid, Luis Serrano is originally from Sonora, Mexico. He migrated to the US as a child and has called Los Angeles home for two decades. For the last several years he’s been organizing with the Immigrant Youth Coalition of Los Angeles to better the circumstances that he and his fellow immigrant and working class community members and family live in.